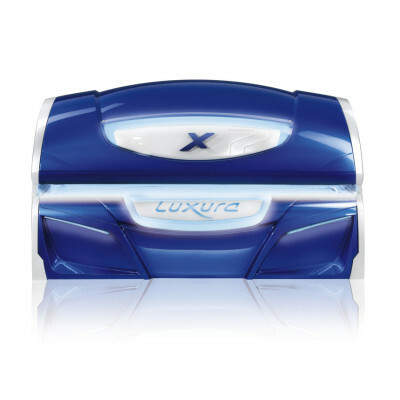 The new Luxura V8 has a dazzling design that illuminates from the beautiful top to bottom. The smooth, high-quality finishing – with no visible fastening materials – emphasizes it’s stylish appearance. 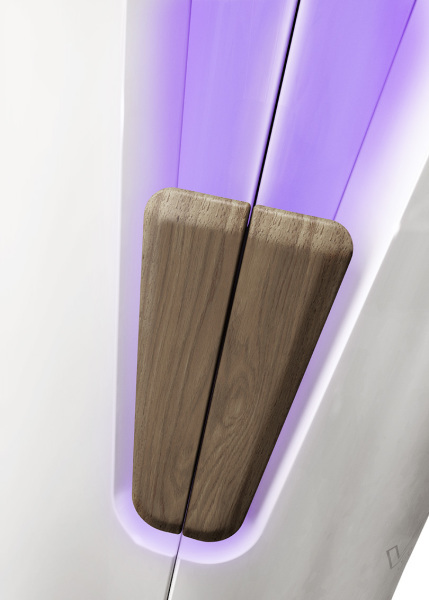 Just like the special Ambient FlowLight changes colours smoothly for an attractive glow of light that complements the splendid design. 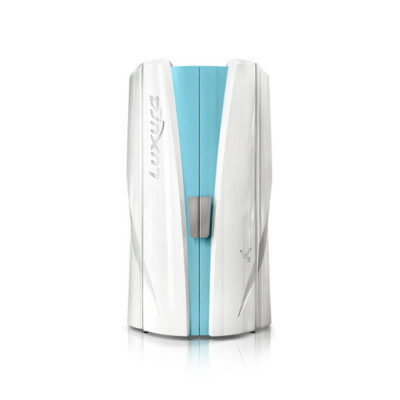 This feature gives the V8 the appearance that fits your salon ambience and cabin perfectly. Maintenance and service can be carried out easily. By removing the control panel inside the V8 you have access to all electronic components. 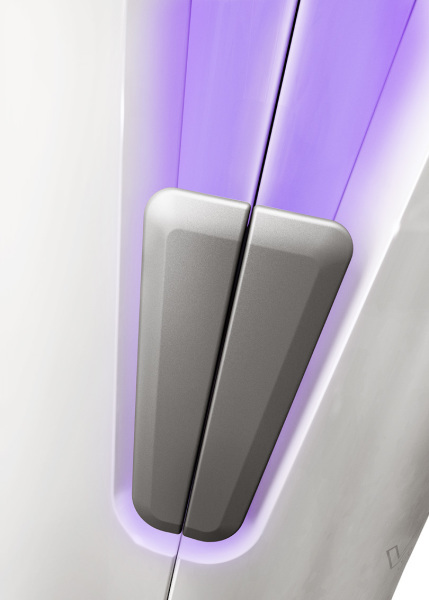 The acrylics are simple to open as well, by the unique aluminium click system for maintenance like cleaning and replacing tubes in an easy way. 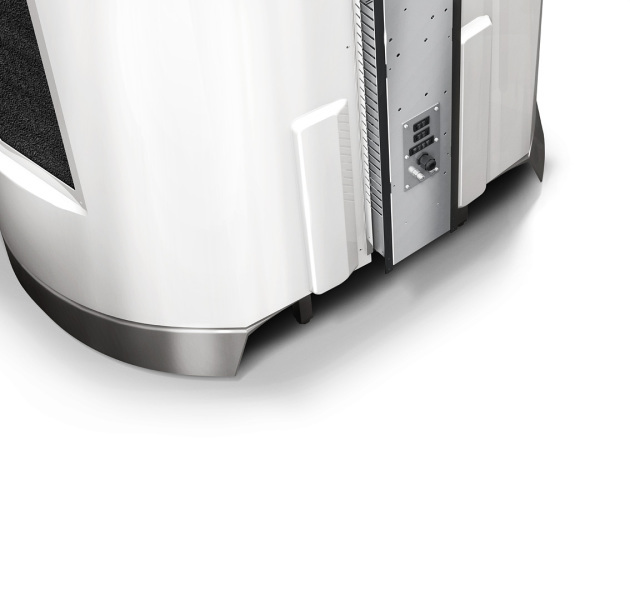 On the outside, dust filters are cleaned quickly. In addition, the Qsens jerrycan and Xsens cartridge are placed outside the vertical tanning bed in a secured unit for quick replacement. What do I need to do before I start a tanning session? (1) You will find a skin-type table in the instruction manual for your device. Use this table to determine which type of skin you have so you can adhere to the recommended session time. (2) Remove jewellery, cosmetics and perfume. Some medicines and beauty products contain substances that can lead to undesirable reactions during tanning. Other substances sometimes also have a similar effect. Your instruction manual contains a list of some substances known to possibly react to UV light. Consult this list before your tanning session. Can I tan for the length of time shown in the table during my very first tanning session? No. 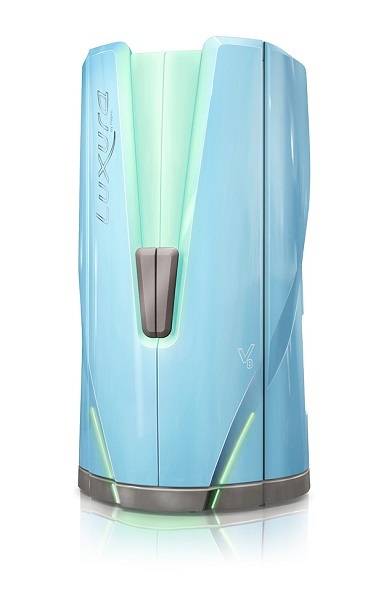 Reduce the session time by 20% during the first 50 hours of use of the new sunbed. During this period the energy consumption of the lamps is 120%, rather than the usual 100%. 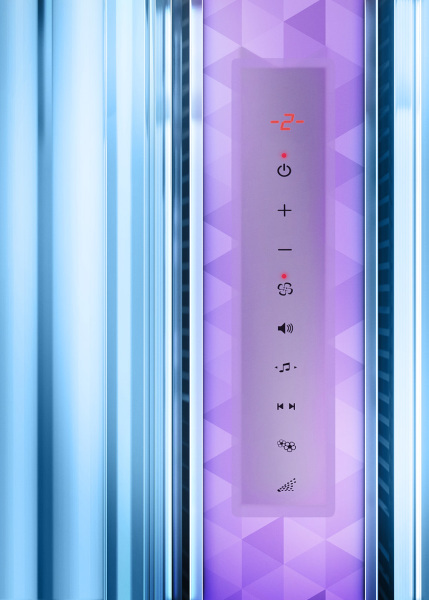 After 50 hours the lamps will operate at the normal capacity of 100% to 80%. You can then adhere to the recommended session time. Do I need to build up the tanning sessions gradually? For both outdoor tanning and tanning on a sunbed it is a good idea to build up your sessions gradually. 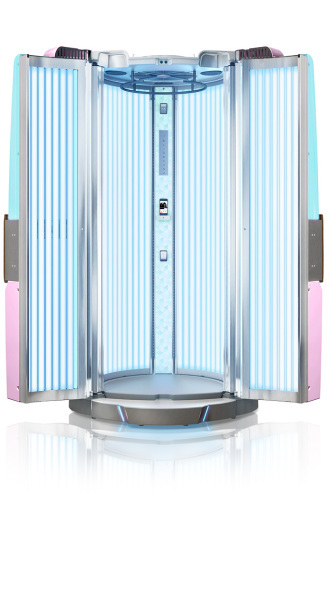 Because sunbed lamps, just like the natural sun, produce both UVA light (direct pigmentation) and UVB light (indirect pigmentation and thickening of the skin), the sunbed can be used to prepare the skin for a holiday in the sun or the new outdoor season. Avoiding sudden long exposure of the skin to sunlight, after months of little sun exposure, reduces the chance of strong reactions, such as sunburn or a sun allergy. 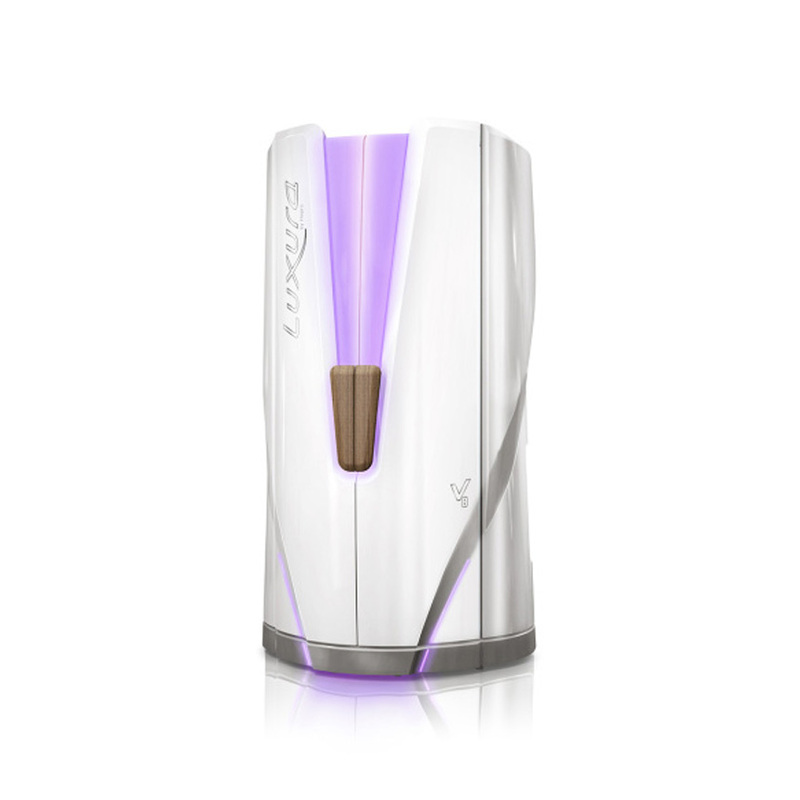 The ideal situation is to give the skin time to gradually adjust to UV light. That is easy to do with a sunbed, because the session time can be exactly adjusted to your own skin type. How does my skin become tanned? While tanning, your skin cells are stimulated to produce pigment. This happens to protect the tissue directly beneath the skin from the damaging effects of UV rays. Pigment cells produce the pigment melanin: a substance that protects the skin cells from burning. The outermost layer of the skin grows thicker and becomes brown. The stronger the natural pigmentation of the skin, the more resistant it is to the effect of ultraviolet light. Your skin type, the extent to which your skin has already built up pigment and the amount of time it has had to adjust to the UV light determine how long you can enjoy the sun without burning. After tanning, I have white spots around my tail bone and on my shoulder blades. What can I do about this? Generally this only happens when you use a canopy sunbed. These areas are known as pressure points, caused by the weight of the body pressing the skin against the acrylic in certain spot. Blood flow is restricted in these areas, starving the skin of oxygen. This interferes with tanning. To prevent this, change your position now and then during tanning to avoid putting pressure on the same points the whole time. How many sessions do I need to do each week to maintain my tan? To maintain your tan and look your best, two to three sessions per week are required. Can I read while lying on the sunbed? No, UV light is harmful to the naked eye, so we strongly recommend you avoid reading while using the sunbed. Always wear special UV-protective goggles during a tanning session. Never look into the lamps with unprotected eyes. Is it dangerous to fall asleep on the sunbed? No, the sunbed it specifically designed not only for tanning but also to help you relax. 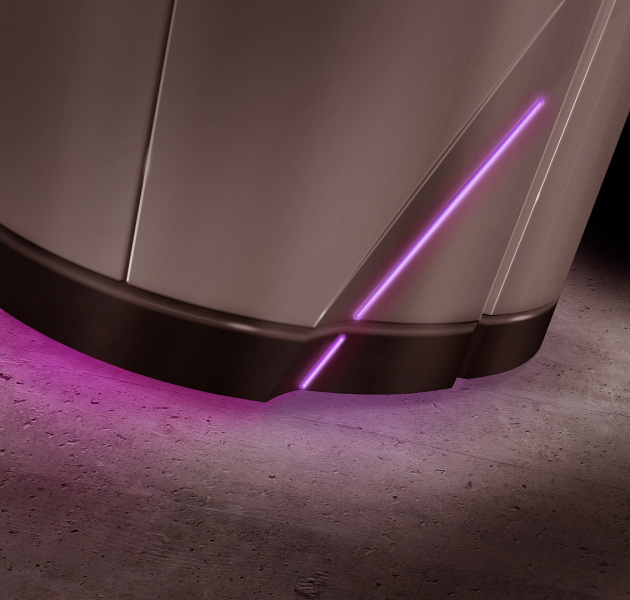 The sunbed switches off automatically when the set time has elapsed. Therefore you do not have to be afraid of becoming sunburned. How many days do I need to wait between my first and second tanning sessions? To allow your skin to slowly adjust to the UV light and to see whether you have any undesirable skin reactions, it is best to skip one day after your first session. Then you can continue with the second and additional tanning sessions. There is no longer any need to skip a day between sessions. Is UV light from the sun the same as UV light from the sunbed? One of the greatest misconceptions about the sunbed is that the light from the lamps is completely different from outdoor sunlight. The modern sunbed lamps provide a combination of UVA and UVB, just like natural light. Filters prevent UVC emissions from the lamps, just like the ozone layer acts as a filter for the sun. The intensity of the sunbed lamps is comparable to the strength of the midday Mediterranean sun. In contrast to the sun when outdoors, it is always clear exactly how much sun your skin is getting from the sunbed lamps. This allows you to enjoy the sun responsibly, without getting burned. Do I get a different kind of tan from a sunbed than from the sun? 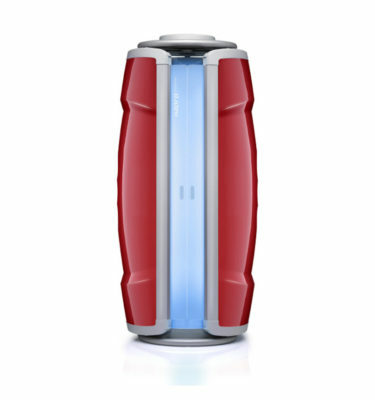 The sunbed lamps produce a small percentage of UVB and a greater percentage of UVA. Therefore the skin responds exactly as it does outdoors, by becoming browner and thicker. There is no difference between a tan from a sunbed and from exposure to the sun: the pigmentation process that occurs is exactly the same. So, quite simply, there is no such colour as tanning-bed brown! The tan you develop on the sunbed will last just as long as a tan from the sun. Should you shower before or after a tanning session? It is better to shower after tanning, because most people use soap, shampoo or other cosmetic products while showering that affect the skin’s natural oils. There is no need to be afraid that showering after tanning will wash away the brown colour. That’s just a myth. Does my skin need extra care when tanning? Your skin requires extra care before and after tanning. A bit of extra care always gives the best results. A body scrub removes dead skin cells from the surface and stimulates beautiful, even tanning. After tanning, you should apply a hydrating body lotion or milk to keep the skin soft and supple. Why is it important not to wear any cosmetics, like perfume and make-up, when tanning? The combination of ultraviolet light and certain cosmetics can cause a skin reaction. To avoid this, we therefore recommend that you make sure your skin is clean before tanning. Why can't I apply sunscreen, sun protection oil or tanning accelerator lotions before using the sunbed? These products contain ingredients that have an impact on the session times and make the prescribed session times unreliable. Do not use tanning pills when tanning on the sunbed either. The combination of these pills and UV light can increase the chance of skin irritation and sunburn. How long can I lie on the sunbed? First determine what kind of skin you have. The instruction manual contains a skin type table for this purpose. It also includes a table of session times. After determining your skin type you can consult this table to see exactly how long you may tan on the sunbed. After tanning on the sunbed, can I lie in the natural sun the same day? 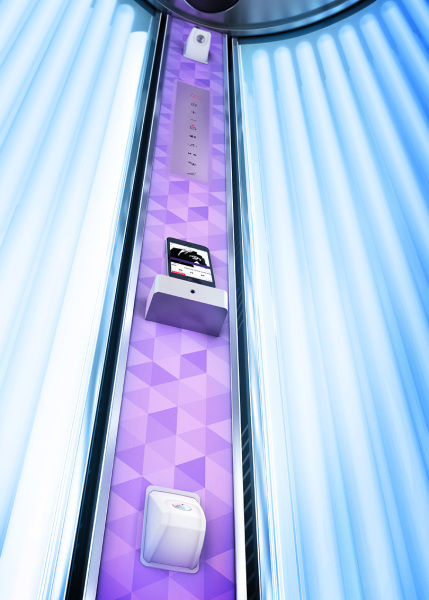 Your recommended session time for the sunbed is based on the full amount of sunlight you should have for that day. If you nevertheless lie in the natural sun without protection, you risk sunburn. Does sunlight have positive effects other than tanning the skin? There has been lots of scientific research into the effects of sunlight on the skin and body in recent decades. Until about ten years ago the focus was mainly on the negative effects of sunlight, such as accelerated ageing of the skin upon excessive exposure to UVA and an increased risk of skin cancer. Since then, however, scientists around the world have conducted many studies that specifically demonstrate the benefits of sunlight on the human mind and body. What is vitamin D and what's the effect of it? The sun vitamin, as vitamin D is often called, is being named in more and more scientific studies as the essential nutrient that plays a key role in human health. Truth be told, vitamin D is not a vitamin at all but rather a naturally occurring hormone in the human body. This unusual vitamin plays an important role in our body in a number of organ systems. For instance, vitamin D regulates the levels of calcium and phosphate in the blood by stimulating the liver and kidneys. The sun vitamin reduces the mobilisation of the calcium in our bones (osteoporosis). It also inhibits the secretion of parathyroid hormone from the parathyroid gland (overproduction results in symptoms such as fatigue, nausea, loss of appetite, thirst and bowel obstruction). Finally, Vitamin D has an important effect on our immune system. Why is vitamin D called 'sun vitamin'? It has been scientifically proven that humans have evolved in our natural environment such that we can obtain 90% of the vitamin D we need from the sun, through the skin. Eating certain foods, such as oily fish, also provides vitamin D, but it is mainly sunlight that stimulates the production of vitamin D. This natural process starts in the skin after exposure to sunlight, and particularly UVB (which, in addition to UVA, is a component of sunlight). Here we are talking about the human form of the vitamin, D3, which can only be generated by sunlight. The body itself regulates this process, breaking down any excess that is produced. This is in contrast to the oral intake of supplements, in which the plant form, vitamin D2, is introduced directly into the body. A large excess of this vitamin can result in poisoning, because the body cannot break it down. Nevertheless, the likelihood of a vitamin D insufficiency is greater than that of an overdose. Does vitamin D have a preventive function in cancer? Adequate vitamin D in the body has a positive impact on many processes. Worldwide, ever more scientific research is being conducted to confirm these processes. It has now been proved, for example, that the sun vitamin plays a preventive role in the development of colon cancer. In addition, there is increasing evidence that vitamin D also has a preventive effect for other internal cancers (such as breast cancer). What should I do when I have sunburn? Always try to avoid sunburn by sticking to the recommended session times, tailored to your skin type. If the skin still looks red 16 to 24 hours after the tanning session, the sessions should be stopped, because the skin first needs to repair itself. It is therefore wise to avoid direct sunlight as much as possible until the redness has cleared. After a week it is fine to begin using the sunbed again. What should I do if I have a particular skin disorder? Always consult your doctor before using the sunbed or starting a series of tanning sessions. People with certain skin conditions, such as acne and psoriasis, may benefit from the sun, while other disorders may be aggravated by it. What should I do if I have allergic skin reactions after tanning? It is better not to use the tanning device. Consult your family doctor..
Can children use the sunbed? People under 18 should not use tanning devices, since their skin is still sensitive and we assume that youth spend enough time outdoors in winter and summer to enjoy the benefits of the natural sun. Naturally the strong advice to avoid too much exposure to sunlight holds for them as well. Can pregnant women use the sunbed? UV rays from the tanning bed are not dangerous for the unborn baby. Nevertheless, many women react to UV light differently while pregnant than they otherwise would. This is because a woman’s body produces a hormone during pregnancy that can result in irregular pigment formation. This is most common in the face and is called pregnancy mask. Therefore, be careful when sunbathing during the pregnancy and do not use the sunbed if you find that you are overly sensitive. If in doubt, consult your family doctor. Do I need to use the special protective goggles? Yes, because UV light that directly enters the eyes can cause eye disorders such as snow blindness, welder’s flash or cataracts. I use medications. Can I use the sunbed? If you use medications and want to tan on the sunbed, consult the information leaflet or ask your doctor or pharmacist. People taking any of the medications on the following (non-exhaustive) list should not use a sunbed, nor should they lie in the sun outdoors. These medications cause a photoallergic or phototoxic reaction or a light hypersensitivity. Heart: nifedipine and amiodarone, Sleep/allergy: promethazine, Skin: tretinoin, methoxsalene and coal tar ointment, Antibiotic: doxycycline, tetracycline and nalidixic acid, Antifungal: griseofulvin, Diuretic: furosemide, Diabetes: tolbutamide, Antipsychotic: chlorpromazine, Rheumatism azapropazone, Malaria: chloroquine and nivaquine. Do the tanning sessions on a sunbed give the same protection as under the natural sun? On the sunbed you basically tan the same as in the natural sun, yet the natural sun is much less predictable. Depending on where you are, the time of day, your altitude above sea level and the type of weather, the natural sun can have a significantly higher UVB percentage. This means that you still always run a certain risk of sunburn, even if you have built up a good tan on the sunbed. Preparing on the sunbed does give you an important measure of protection. How many times per day can I use the sunbed? Limit your tanning sessions to once a day. Make no distinction between tanning indoors and out; your skin doesn’t either. How many times per year can I use the sunbed? With normal exposure to natural sunlight, you should not use the sunbed more than about 50 times a year. I have a pacemaker. Is it safe for me to use the sunbed? Pacemakers are subjected to extensive technical testing by the manufacturer and are resistant to normal UV rays. There is no reason for people with a pacemaker to avoid using the sunbed. If in doubt, consult your doctor. I have varicose veins. Can I use the sunbed? Yes, there is no problem using the sunbed for people with varicose veins provided the feet are elevated slightly and, for example, are supported on a towel. If you have just undergone surgery for varicose veins, however, it is a good idea to temporarily avoid tanning. Will my tattoo discolour with use of the sunbed? All tattoos will fade and blur slightly over time, but this is not a direct result of ultraviolet radiation. Some colours of ink, however, especially green and red, can produce an allergic reaction upon exposure to sunlight. The best way to prevent this is to cover the tattoo with a sunscreen product when you lie in the sun or on the sunbed. Can I wear my contact lenses while using the sunbed? Yes, this is allowed, but always wear the provided goggles that protect the eyes from UV rays. Should older people still use the sunbed? Yes, one can certainly continue using the sunbed later in life. Older people enjoy many benefits from sunbathing: muscle aches and rheumatic pain are often diminished. Moreover, solar radiation (mainly UVB) also promotes the production of vitamin D, which helps to strengthen the bone structure. How should I clean my sunbed? * Always remove the plug from the mains socket before you start cleaning the sunbed. *Clean the canopy with a damp cloth. Never use an alcohol-based product for this component. *The tubes can be cleaned by removing the acrylic sheet. You can clean the tubes with a dust cloth. *The acrylic sheet can be cleaned with a special acrylic cleaner. Never clean the acrylic sheet with a cleanser that contains alcohol. This is because alcohol degrades the UV transparency of the acrylic sheet and causes cracks. What should I keep in mind when deciding where to put the sunbed? Do not place the sunbed in a humid location, such as a bathroom. Make sure the room is or can be ventilated. When do I need to replace the acrylic sheet? An acrylic sheet lasts for between 1200 and 1500 hours of light exposure. 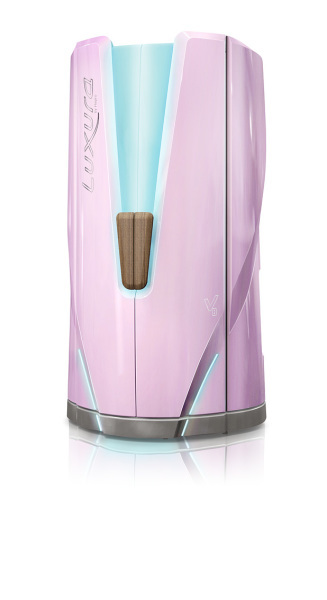 When these hours have elapsed, the UV transparency of the sheets drops drastically. So make sure you replace the sheets before then. Please contact your dealer when you need to remove the acrylic sheets and tubes. Make sure the new tubes are of the same type. How do I know whether my tubes are still good? 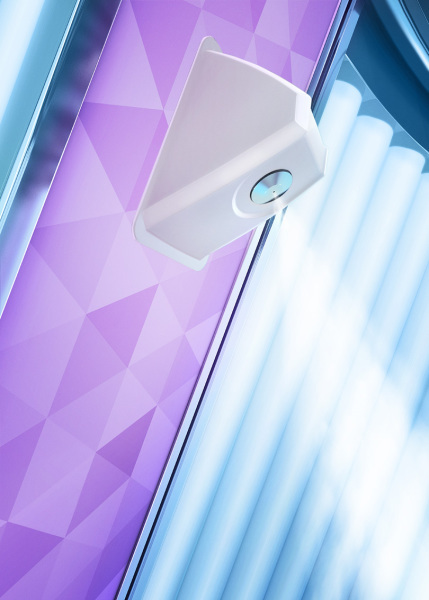 The average sunbed tube lasts for 500 hours. If you have doubts about the strength of your tubes, please have a lamp tested at a specialist shop near you. When should I replace the tubes? Replace the tubes on time, certainly after 500 hours of use. Ask an authorised Hapro dealer for the tube specifications. What should I do with my old tubes? Old fluorescent tubes are classified as chemical waste. Therefore take them to the chemical waste collection point designated by your municipality. Does a sunbed consume a lot of power? 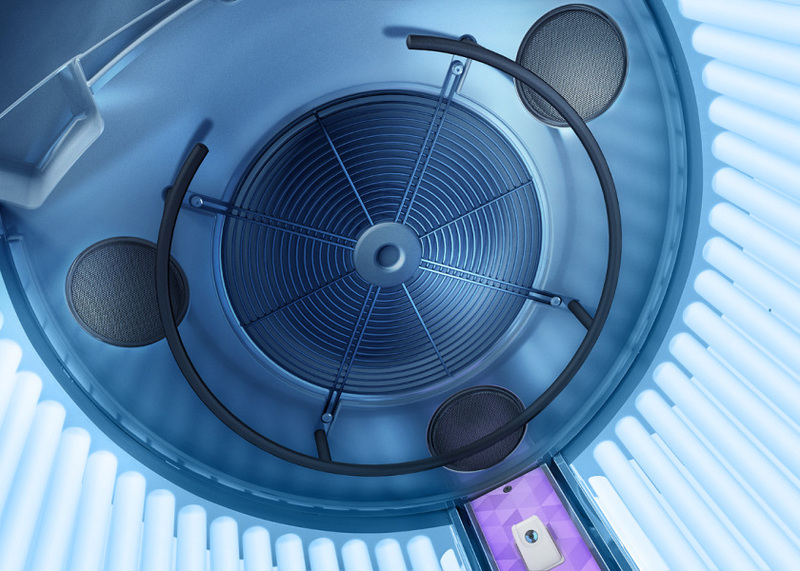 A sunbed uses relatively little power. 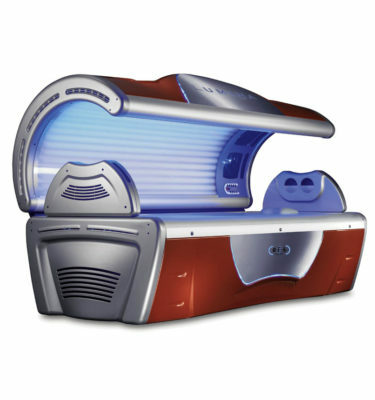 For example, a sunbed with ten 100 Watt tubes consumes just 0.5 kWh during a half-hour tanning session. In comparison, a washing machine uses an average of 2 kWh of energy for a 90 °C wash cycle.